Amount Per Serving %Daily Value* Calories 27 Calories from fat 27 Total Fat 3.0 g 5% Saturated Fat 0.6 g 3% Trans Fat 0 g † Cholesterol 10 mg 3% Vitamin A 150-600 I.U. 3-12% Vitamin D 1-12 I.U. 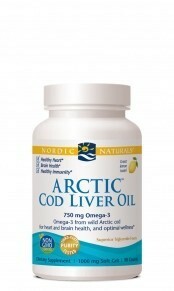 0.25-3% Total Omega-3s 675 mg † EPA (Eicosapentaenoic Acid) 225 mg † DHA (Docosahexaenoic Acid) 315 mg † Other Omega-3s 135 mg † *Percent Daily Values are based on a 2,000 calorie diet. Three soft gels daily, with food, or as directed by your health care professional or pharmacist. 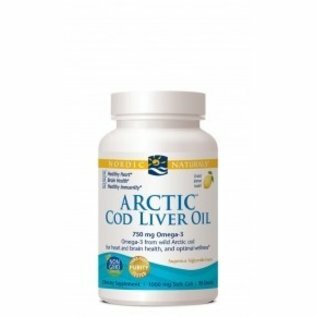 Purified arctic cod liver oil, soft gel capsule (gelatin, water, glycerin, natural lemon flavor), natural lemon flavor, d-alpha tocopherol, rosemary extract (a natural preservative).